Education is one of the most important types of investment in human capital that is beneficial. Private returns to education include financial option returns, non-financial options and non-market returns. On the other hand, the social returns to education include economic growth and non-market social effects. Education has many development goals i.e. it is considered as a tool of social empowerment and global competitiveness. Moreover, education is the most significant asset that explains income disparities among individuals. Accordingly, equity in education leads to equity in income distribution. 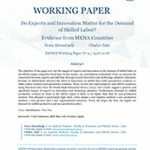 The main objective of this paper is to estimate the demand and supply functions for schooling in Egypt using the data of the Egypt Labour Market Panel Survey 2012. 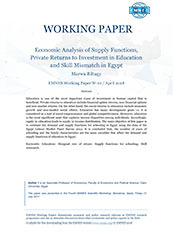 It is concluded that, the number of years of schooling and the family characteristics are the main variables that affect the demand and supply functions of education in Egypt. 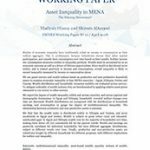 Asset Inequality in MENA – The Missing Dimension?